This picture is out-of-date. When I took it, reconstruction of this intersting home was beginning. It has been completed and looks as it did when Grover Cleveland governed the nation. Emanuel Schloss was a dry goods merchant and haberdasher who, with his brother, ran a prosperous store in downtown Detroit in the decade after the Civil War. 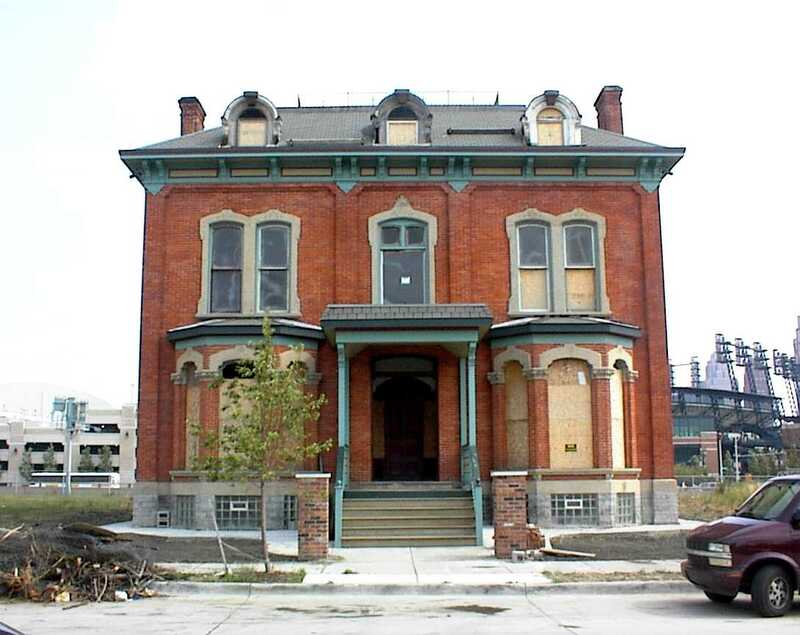 In 1870, he decided to have this lovely, although strongly rectangular, home built in Brush Park. This neighborhood was then emerging as the residential neighborhood for Detroit's elite. This is a two-story Second Empire solidly built home with extensive gray limestone trim. At that time, elegant homes were typically built upon a linestone foundation that projected a few feet above ground level. This gave the architect the opportunity to design an attractive elevanted entryway. You will observe projecting bays on the Winder street frontage with decorative stone hoods and keystones. The traditional mansard roof displays attractive dormer windows, reflecting the style of that era. This is one of the best examples of Second Empire home design to be found in Detroit today. Second Empire refers to the architecture popular in France during the reign of Napoleon III from 1852 to 1870. A feature of this architectural style was the use of Mansard roofs. There are interesting questions about how extensive and firmly enforced were the residential restrictions that Jews faced in Detroit and other United States cities before the 1960s. The Boston Edison neighborhood, in its earliest years, was distinctive for being open to Jewish residents. Emanuel and Rebecca SchlossGerman Jewswere much involved in the early development of Detroit Jewish community. The first congregation was Beth El founded in 1850. Apparently, Jews were welcome to build their homes with Detroit's elite when Brush Park was developed. I do not know the complete history of this home. At one time, many many similar homes lined the streets of Brush Park. In the 1920s, other Detroit neighborhoods became more appealing to the city's elite. During the Depression, many homes similar to this one were converted into rooming houses. Presumably, they were filled with defense workers in the 1940s when Detroit was the arsenal of democracy. But this neighborhood did not fare well after World War II. Many of the homes fell into disrepair and quite a number were torn down. Thus, you see many vacant lots as you walk the street of Brush Park today. In the early 2000s, this marvelous Second Empire home was restored to its original glory. It now serves as an inn with five suites and provides meeting space for weddings and other social events. Quite a few Detroit neighborhoods are being redeveloped. There was something of a turnaround in Brush Park in the late 1990s, thanks to a variety of factors including a declining crime rate, increasing professional employment downtown and in the nearby medical centers, the coming of the two new stadia and more racial comity. However, in many Detroit neighborhoods, such as Brush Park revival, depended not so much upon a grand city plan or major new investments from the local governments. Rather, entrepreneurs purchased properties such as this one at relatively low cost and converted them into appealing profit-making structures. State Registry of Historic Sites: P252400. Listed August 18, 1988. This home is within the State of Michigan Woodward East Historic District. National Register of Historic Places. This home is within the Woodward East Historic District.